One of the reasons you have found lots of baked good recipes here, for the most part, is that I have to measure my flour and nothing else. Seriously, I’m not exaggerating when I say I am a dump cook! My mother in law has marveled for years that I can chop ingredients straight into the pan without a recipe or a measuring cup. Frustrates my “Beaver Personality” daughter to no end. She’s all about details, details, details. 🙂 So for her benefit, and so I can share this recipe with you, I weighed and measured every ingredient! Do you like potato soup? I love it! The creamy potato with the rich broth and bacon garnish… a thing of the past when I went Keto. But to be honest, because our diets have become so ‘clean’, my family had begun to complain when I occasionally still made potato soup because it could cause bloating and heart burn. You see, it’s not a great idea to mix starchy foods with proteins. Add some fats in there and it’s a digestive nightmare. Chicken broth gives this soup rich flavor, healthy cauliflower gives it bulk, while some avocado makes it creamy. Yes, avocado! 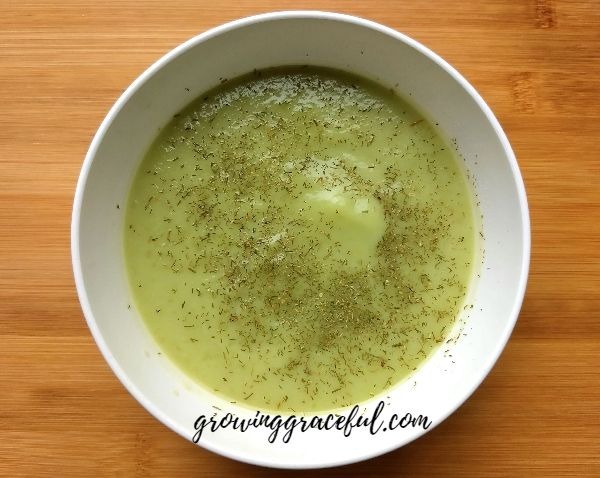 Some of my kids don’t like avocados straight, but they love this soup. All of the macros are conservative, so you can afford to either eat more soup or you can garnish it with bacon, grated parmesan, and dill, and help yourself to a slice of your favorite low carb bread on the side. Each one cup serving provides 96% of the recommended daily allowance of vitamin C, 6% of recommended iron, and lots of good fiber. I make this for lunch once a week for this hungry home-schooling family. It is a favorite! FYI: I make my own broth when I cook a whole chicken in the Instant Pot (or the occasional turkey in the roaster). I cook my chicken with garlic, basil and thyme. While I put my broth through a sieve to remove the debris, the flavor stays with it. You can use boxed broth, but if you find you would like more flavor you can add a pinch of these herbs and see if you like it. Simmer broth, leeks, and cauliflower until everything is tender. Scoop avocado from shell in chunks, making sure you get all the dark green, nutrient dense fruit. Just half the avocado! Add salt (optional), and use an immersion blender until creamy. Macros are calculated in cronometer.com.